Is carpet suitable for bathrooms? Here are the pros and cons. Some will gasp at the idea, others will tell you all the wonderful reasons why they love having carpet in their bathroom. It really is a personal choice, but here we will take you through all the pros and cons of having this type of flooring in your bathroom, from an expert point of view. There’s no denying that carpet can offer additional luxury, indulgence and opulence to a bathroom. Carpet manufacturing has come a long way, and carpets specifically for the bathroom are available. These carpets are stain-resistant and have waterproof backing that offers protecting for the floorboards and underlay. STYLE! A well looked after and maintained carpet in a bathroom will certainly make a style statement in a room of the house, that most people wouldn’t expect to come across a carpet. Opting for carpet in a bathroom can really finish off the room in a way that other flooring can’t. A soft plush pile will add a lavish and luxury feel to the space, a space that is often created for relaxation, calming and cleansing purposes. Perhaps the most obvious pro of having carpet installed in a bathroom is that it offers ultimate warmth, comfort and softness. Stepping out from the shower or tub and onto a floor that isn’t cold and hard can really enhance the bathroom experience. Do you have small children or elderly people living in your property? If so, carpet can do wonders at offering reassurance and peace of mind that slips are less likely to occur. Perhaps not a well know fact, but a carpet that has been created and intended for bathroom use will remain odourless, even when wet, whereas a carpet in a bathroom that hasn’t been designed for this room will likely become damp and produce bad smells. Probably the biggest con of having carpet installed in a bathroom is the fear people have about the practical consequences of doing so, and not knowing how to care for carpet in a bathroom. 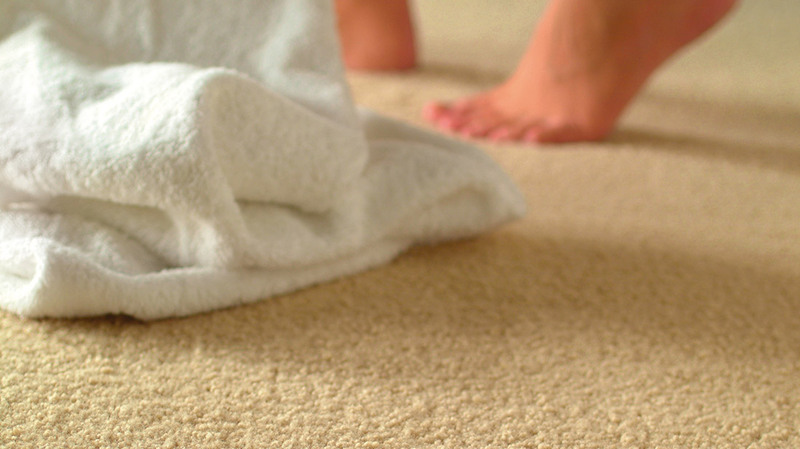 Unlike with items such as bathroom mats and rugs, which can be removed from the bathroom and machine washed, permanently fitted carpet can’t be removed and therefore may be tricky to care for and maintain its quality. Harmful bacteria, mould, mildew and dirt can all easily build up in carpet that is fitted in a bathroom, due to the heavy moisture present in the room. If a bathroom specific carpet isn’t chosen, the carpet is very unlikely to be able to withstand and cope with the water that will hit in and then carpet padding and fibres will become water damaged, potentially causing it to erode and become destroyed. It’s not only the carpet that can become damaged in a bathroom. Having a consistently wet or damp carpet in your bathroom can also lead to problems such as soft furnishings within the room, also becoming damaged, as the mould spreads and grows. So, there you have it – both sides of the argument for and against carpet in a bathroom. It really is personal preference and what kind of look and style you want your bathroom to have. We would like to add however, that we wouldn’t recommend a carpet for your bathroom that hasn’t been designed specifically for this unique room. You’ve only got to look at the cons above to realise why. Whilst we do offer a carpet for bathrooms, we’d recommend using either cushioned vinyl flooring or luxury vinyl flooring to make your bathroom the stuff of dreams. For more advice on which flooring is best for your bathroom, contact Kennington Flooring today.